Scott Brownrigg’s response to the RIBA’s recent International Design Competition for a new iconic Bridge in Salford crossing the River Irwell, has been inspired by the city’s historic links to the textile industry and the significant importance of the river. 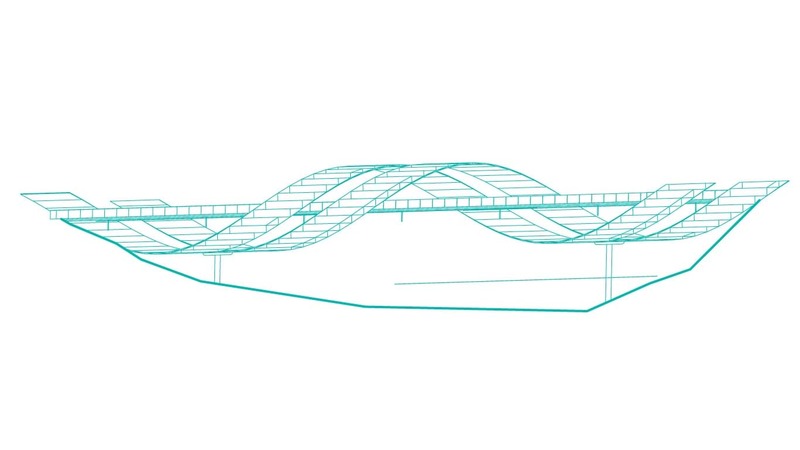 Here we publish Design Research Unit’s response - The Ribbon Bridge, submitted in collaboration with Arup structures. To submit designs for a new pedestrian bridge across the River Irwell, as part of Irwell River Park (IRP) led by Salford City Council. The bridge needs to support the IRP’s aims to create an international waterfront destination that will catalyse the economic resurgence of the Manchester City Region over the next decade. Adjacent to the University of Salford, the new bridge will further unlock the vast development potential of this major corridor linking Salford and Manchester. The new bridge link forms an important component of a wider package of connections to be delivered through IRP known as the Middlewood Loop. 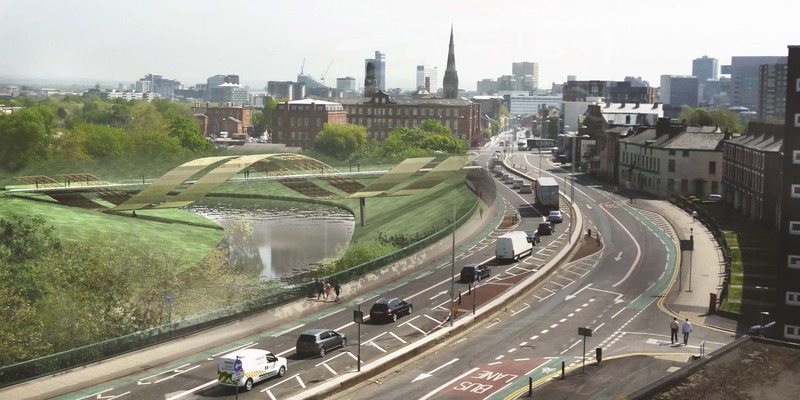 To provide a high quality new landmark pedestrian bridge across the River Irwell, connecting The Crescent (A6) to The Meadows, a 7 hectare site which forms the northern anchor of the Irwell River Park project. To open up access to The Meadows and ensure that it will become a well-used resource for the local community, while also attracting new visitors to the area. To maximise the contribution of The Meadows site to the transformational profile of this part of Salford and set a benchmark for future development activity in the surrounding area. The new pedestrian bridge into The Meadows will be an iconic structure, providing a visible landmark along The Crescent / Chapel Street. It is likely that land raising will be required on The Meadows site to accommodate the landing point for the new bridge to ensure that the gradient of the bridge is DDA compliant. Designs should consider how this new landscape feature can be utilised to make a positive contribution to the site. There should be no bridge support structures within the River, as this will not get the support of the Environment Agency. The bridge support structure should be built off the river banks. The history of Salford is interwoven with the textile industry. The trade, production and finishing of woollen goods was at the core of Salford’s earliest development. City expansion exploded during the Industrial revolution, particularly through the large number of workers employed in the manufacturing of textiles. The River Irwell enabled entrepreneurs to develop the cotton industry which was subsequently replaced with finishing trades in rexine and silk dyeing, fulling, bleaching and silk spinning. The historic link between the river, the city and the silk trade has inspired the Ribbon Bridge. The design takes the form of a dialogue between these elements, a ‘silk route’ linking the future of Salford to its past. Golden ‘ribbons of silk’ spiralling over the river complete this key section of the Middlewood Loop. The ribbons are formed from a series of delicate steel grid-shell arches and supporting structures which define the iconic structure. 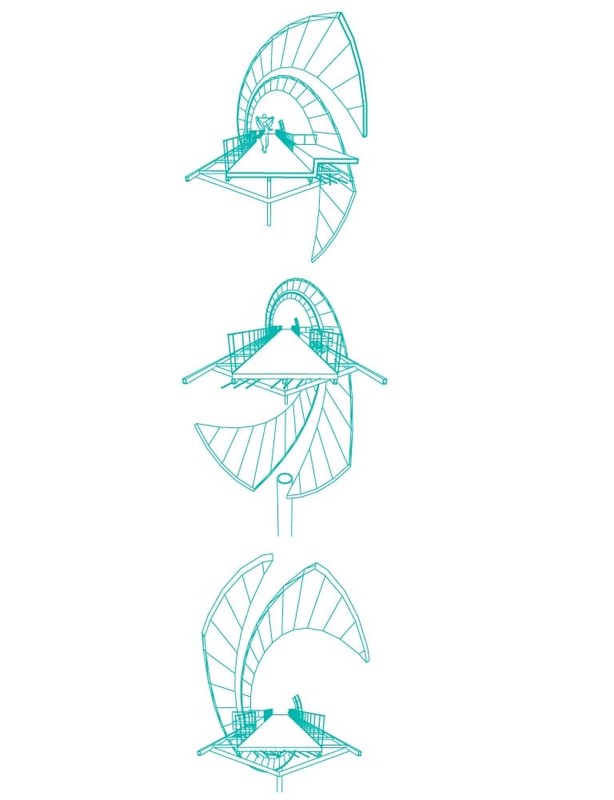 The grid-shell ribbons act in conjunction with the deck to form a three-span structure which provides regular support to the slender footway, allowing it to travel delicately through the centre of the spiral. The central span of this structure is a series of tied arches with the deck supported from the arches via hangers. On either side there are cantilever structures with the diagrid which act in compression and tie forces taken through the deck. These deliver the load to the main piers and are stabilised through their connection to the river bank. The points where the cantilevers support the tied arch are displaced laterally in equal and opposite directions to create a balanced spiralling effect. Rest points and seating are located at the points where the foot/cycle way connects directly to each of the ribbons. The ribbon bridge creates a spectacular flowing silhouette when viewed from The Crescent as you enter Salford and from the junction with Oldfield Road. The bridge has been designed as a narrative experience for the user, as you cross the water the ribbons spiral and flow around you, giving framed views and perspectives of the landscape beyond. The clean lines, sharp detailing and elegant proportions use materials that need minimum maintenance. The spiral, formed from a recycled steel grid shell structure is clad with a ‘Tecu Gold’, which encloses the central path. This then flows down into the meadow and delivers connectivity to surrounding areas. The spiralling ribbons evoke the evolving future of Salford, whilst the golden colour has been selected as a reference to the silk in the graduation gowns worn at the University of Salford. The students will pass through the Ribbon Bridge, between the University and the City, representing the passage of their development to the world beyond, equipped for life with the new knowledge they have gained. The design will be timeless, with specific relevance to its location, and offers the user; whether local or visitor, with a delightful experience. The design is economically robust yet aspirational, with a rigour that will make it an Icon of Salford.